Your wedding is one of the most important days in your life. We make every effort to ensure your special day is unforgettable. Our three event rooms, the Red Oak, White Oak and Arbour Room can accommodate from 50 to 700 guests for sit-down or buffet meals. Each room has a dance floor and tables can be set up in different ways. In addition, couples renting the Red Oak and White Oak Room may take advantage of a package deal and book the Arbour Room. This cozy room with a fireplace leads to a lovely patio and can serve as an exclusive changing and rest area for your wedding party. Wedding photos can be taken on the picturesque grounds of St. Volodymyr Cultural Centre. The beautiful lawns, trees and flowers gracing the grounds make for a picture-perfect backdrop. 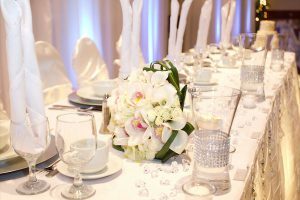 Our event manager will work with you to choose the right wedding package, provide advice and help you plan your reception. Our professional decorator will meet with you to help actualize décor ideas reflecting your personal taste and style. Packages are available at a variety of prices to suit your budget.